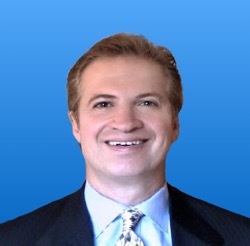 All of these items must be addressed to ensure that we optimally enable the sales team. 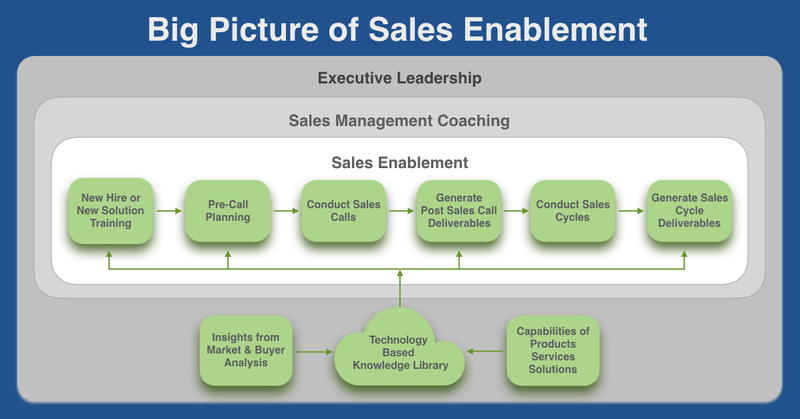 This requires an appropriate long-term view and infrastructure for Sales Enablement. It is shown in the diagram below. Lets look a little more deeply. The role that Executive Management plays cannot be underestimated. More than exercising leadership, they must take ownership of Sales Enablement and take responsibility for its deployment and results. Sales managers are the lynchpins of the sales operation because they must make sure that Sales Enablement objectives are achieved by the way they manage and coach their sales teams. An essential responsibility is to provide salespeople with proactive management by making sure that they are at peak performance when executing your sales process and their use of the appropriate content based on where the buyer is in their journey. Marketing must keep their finger on the pulse of external factors impacting your company, buyer needs and their personas, etc., and lead the effort to translate that information into valuable market and buyer information for sellers, along with the provision of content. Product/service people, who have a clear view of the capabilities your company’s solutions provide to help buyers solve their problems. This team should report directly to Executive Management. Training for the sales team when new solutions or updates to solutions are ready for the market. In fact, I encourage my clients to define a solution as the combination of the capabilities you provide to your buyers + the tools you provide to your sellers to sell the solution, and not release the solution to the marketplace unless those tools are developed. Properly formatted pre-call planning information for sales people that will enable them to construct their call introduction, prepare for their need development discussion, qualify their buyer, and take appropriate next steps. This is an imperative. I believe this is often overlooked by Sales Enablement teams and is big mistake. In sales situations, a buyer looks at you from three perspectives: Your people, your solutions, and your company (stability, etc.). Commonly a buyer’s first interface is with your people, and specifically a sales person. Therefore initial sales calls – and the decisions the buyer makes about your sales person – is critically important. The seller must quickly establish their personal sincerity and competency, be able to conduct an effective business conversation, and provide insight that the buyer believes is of significant value. The call planning tools we provide, mapped to the sales process, are an imperative. A very high percentage of sales people do not send them because of the effort and time required to construct them. However, if automated it can literally take only a few minutes. 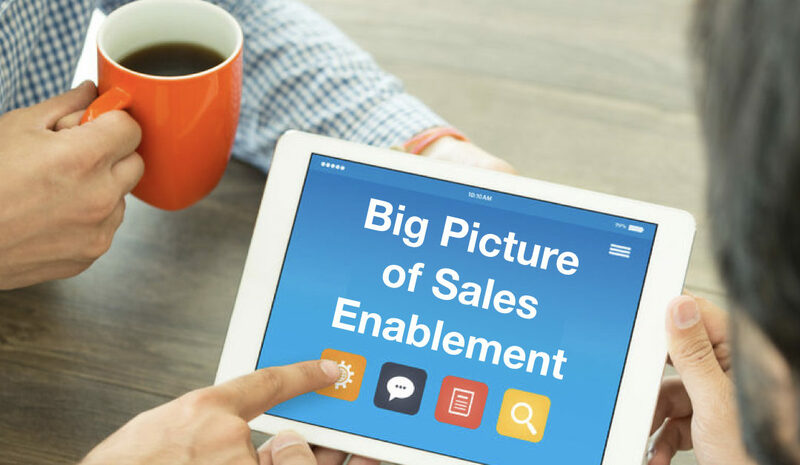 In my view, if this big picture for Sales Enablement infrastructure is followed companies can achieve the results that the Aberdeen Group found: 56% of Sales Enablement practitioners are seeing greater growth rates in their annual revenues. You can take a deeper look at our approach and the services we provide for Sales Enablement. If you’d like to see how Sales Enablement integrates with CRM take a look at the Adventace Sales Management Systems™.